Sarah has a wide spectrum of art mediums and styles. 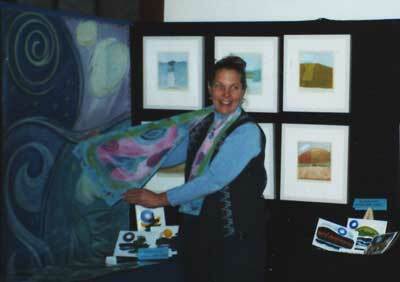 Her artwork spans from: landscape and landscape related with minimal architecture elements – featuring the quintessential Maine ice hut or outbuilding to her wonderfully fun, stylized animal paintings. Ms. Brandon’s mediums range from collage/mixed media, monoprints to bold watercolors for works on paper and acrylic painting on canvas or panel. Most recently she has added her one-of-kind painterly canvas floor cloths to her ever-growing repertoire. A line of greeting cards representing a selection of six of her animal paintings are currently available and making a big splash for letter writers.